My father was born in the Ukraine and grew up there. At age twenty, in 1923, he left in order to avoid the Soviet draft. He traveled from the Ukraine to Romania, where he boarded a boat, thinking he was going to the USA. Unfortunately at that time there were immigrant quotas, so instead of the USA, he ended up in Canada, where he established himself in the menswear business. This was the right move and his business prospered. In 1945, the first Chabad emissaries arrived in Canada. There was a group of them – Rabbi Kramer, Rabbi Hendel, Rabbi Greenglass – and my father developed a connection with them, in particular Rabbi Greenglass. Since my father’s was a menswear business, his whole inventory was highly flammable, so it had to be insured. But installing a sprinkler system throughout this building was cost prohibitive. It would have been better to tear it down and start over. He hired an architect to draw up plans, but he didn’t have the wherewithal to go forward with the project. This situation caused my father to become very depressed; he just didn’t know how to deal with it. And that’s when he went to see the Rebbe, and he brought my brother and I along with him. When we came into the Rebbe’s office, my father was quite despondent. He was totally bent over. He walked up to the Rebbe’s desk and laid his hands flat on the desk surface, as if to support himself. He just looked the picture of depression. The Rebbe looked at my father and said in a commanding voice, “Reb Nosson, stand up straight!” In response, my father took his hands off the desk and stood up straight. He explained the problem to the Rebbe – the whole dilemma about the age of the building and the cost of building a new one versus the cost of a sprinkler system. And how he did not have enough money to do either and didn’t know what to do. He explained how frightening it was for him to be without any insurance at all. The Rebbe heard him out and then motioned to my brother who was holding the plans for the new building rolled up behind his back. “Show me the plans,” the Rebbe directed, and we unrolled the blueprints for him. He looked at them and began asking questions as if he were an architect. “How come the basement ceiling is so low?” he wanted to know. And my father said that the ground is rock, and it’s very expensive to dig deeper to make a basement. “The foundations are made for just three stories; why only three stories?” the Rebbe continued to quiz my father. And my father said there isn’t money for more than three stories and, in any case, we never thought about doing anything more. The Rebbe thought about it and said, “You should make the basement ceiling higher and you should make the foundations sturdy enough to add more stories afterwards, even if you don’t have the financing to do it now.” He added that the bigger the container, the more blessings the Almighty can put into it. Then the Rebbe smiled. He told my father to be happy and to think of himself as a soldier going into battle – who doesn’t know the outcome, but who has the faith that he will prevail. He instructed him to go back to Montreal and visit his bank manager with full confidence that G-d was on his side and everything would turn out right. My father walked out of there a different person. In those few minutes, the Rebbe changed him from being despondent and worried to being confident. And sure enough! Upon returning to Montreal, he managed to get a mortgage at a very good rate, and he built a new building. I don’t remember everything now, but I do think he followed the Rebbe’s advice and made the foundation sturdy enough for future expansion. The Rebbe somehow instilled such confidence in him that he was able to proceed aggressively and to ask for things – like bank financing at half the going rate – that he was reluctant to ask for before. The cost of the building was going to be around a $120,000. My father invested $40,000 of his own money and secured a mortgage of $80,000 at six percent (when the going rate was twelve percent). And that’s how he was able to finance the project. I recall that sometime after this, a supplier wanted my father to be his partner in investing in land in the suburban part of Montreal. Ever cautious, my father turned down this offer. But the supplier kept pressing him. Finally, my father consulted the Rebbe. The Rebbe encouraged him to do this venture. He even told my father to sell his house and invest in this land. This was a very aggressive suggestion, but my father heard the Rebbe. When he first told my mother that he wanted to sell the house, she was very much against it. But in the end she agreed, and he did it; he even borrowed money from his children. That’s how much he trusted the Rebbe’s advice. He ended up becoming a partner with the supplier and a twenty-five percent owner of the venture, if I recall correctly. Of course, the Rebbe was right on the mark. When my father and his partner bought the land it was zoned as farmland; the taxes were very low and nothing was happening there. But then the land was rezoned and its value rose dramatically. For twenty years, my father and his partner kept selling off parcels of this land, and it became a source of significant revenue for them for many years until they sold all of it. The land costed around five cents a square foot at the outset, but when they sold the last piece years later, it was close to five dollars a square foot. So it was a very profitable venture. Eventually, because of this investment, my father bought a house in Israel, where he made aliyah in 1978, a happy man. All thanks to the Rebbe. 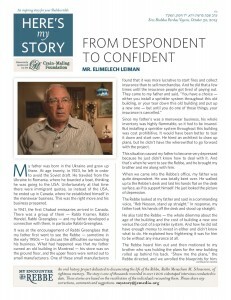 Mr. Elimelech Leiman was interviewed in his home in Jerusalem in May of 2011. In Honor of the birthday of the Rebbe Rashab.